You know how your mother used to tell you that you had to finish your broccoli before you could have your dessert? Now I like broccoli, don't get me wrong. I know it's good for me, and I like it, but let's face it; broccoli isn't nearly as fun as ice cream. So I've been talking a lot about the mechanics of getting the right exposure for your photographs. I like this stuff, but it's kind of like broccoli. Exposure mechanics are essential for your photographic health, but composition is the dessert that makes photography fun. Well, at least it is for me. So I'm going to take a fair amount of time to write posts on different aspects of composition. I'm going to use a fairly broad definition of composition. Composition will include everything that goes into the look and feel of your photograph. Photography is not simply about recording what you see in film. The scene you're photographing is the canvass upon which you are working. The tools of composition are what you can use to create interest, heighten beauty, and even offer interpretation to your subject matter. In the above photograph taken at Brookside Gardens, hopefully you can see that I designed my composition to place the rose off center (we'll call this on the "rule of thirds" later) rather than centering the rose in the frame. You can see texture in the water droplets on the rose petals and in the out of focus flowers that form patches of color in the background. Obviously, I chose to keep this photograph in color, since it (to me) was a significant part of the interest in the scene. The scene was lit by sunlight, but I chose to put the sun to my back to limit shadows in the scene. 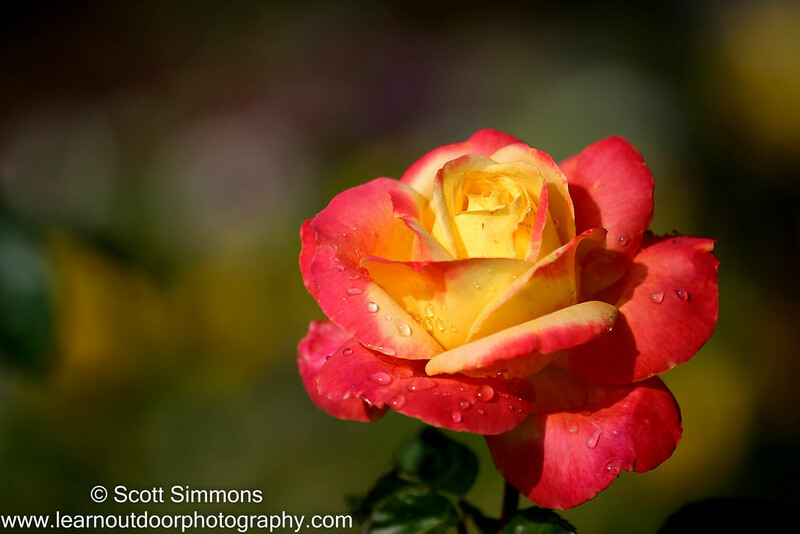 And I chose to use a wide aperture to ensure that flowers in the background would blurry, while the rose was sharp. Design--The most common way we think of composition is the design of your photograph, including the arrangements of elements in a scene, using patterns, repetition, lines, curves, and other design strategies that can add creativity and interest to your photograph. Color--Your photographs can be presented in color or black & white, and the placement of different colors (or shades) in the image can have a dramatic effect on your photograph. Focus--You can decide what to focus on and how much of your image should be in focus. These decisions can also have strong effects on the look and feel of your photograph. These tools of composition are not authoritative rules that you must follow to make your photograph good. The principles we'll discuss are simply patterns that people have identified that seem to correspond with what we find pleasing or beautiful. Knowing the "rules" can help you create better compositions, but knowing when to "break" the rules is just as significant as knowing how to follow them. your comments and postings from your friend's walls as well. After that, you'll move on to Map Mayhem where you'll have to recognize the shapes of countries before the time is up.